Too Much PV in 2008? The following opinion piece is from an independent writer and is not connected with Greentech Media News. The views expressed here are those of the author and are not endorsed by Greentech Media. Jerome Ball intends to trade various PV stocks, primarily with a short bias, over the course of 2008. As a stock trader, I'm always sensitive to boom and bust cycles in an industry because they provide a fundamental backdrop for a stock. I track these cycles on my blog, Alternative Energy Trading. And I've recently gone from near-term bullish to bearish on PV stocks based on two trends I see emerging through 2010: first, that cells and panels will be in major oversupply by the end of 2008 and, second, that demand is set for a pause due to declining or delayed incentives in Germany, Spain and the United States. 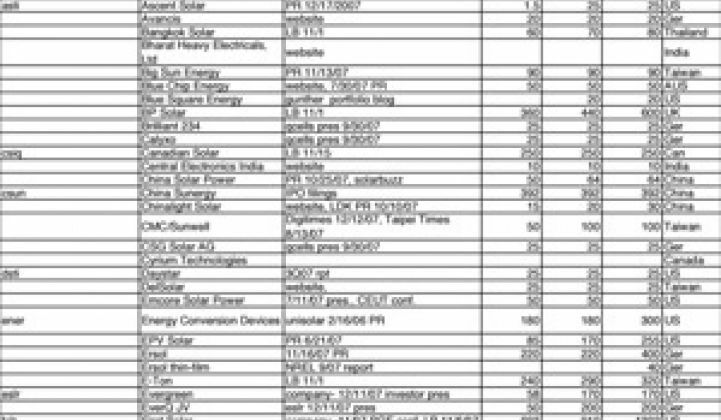 I've compiled a table of year-end capacity through 2010 for more than 90 manufacturers of solar cells (see chart here), indicating my source for each company's number. A solid recent source is the Lehman Bros' Nov. 1 report initiating coverage on the sector. However, that report is already outdated and its cell-capacity data somewhat incomplete to begin with; I've relied on more current data from a wider set of sources including company earnings reports, presentations, Web sites or other press articles. Bottom line: By the end of this year, cell producers will have an installed capacity of 12.4 gigawatts of annual production, according to present manufacturer plans. When you add in solar-thermal capacity (such as from Ausra, etc.) that number grows to 13.1 gigawatts or more. Looking ahead, the 2009 end-year production capacity is simply enormous, at over 17 gigawatts. Is this a problem? Oh, yes, when you look at the demand estimates. Match the year-end 2008 capacity of 12.4 gigawatts with 2009 demand: The European Photovoltaic Industry Association's optimistic ("policy-driven") estimate of 2009 world-wide demand is 4.3 gigawatts. Lehman calls it 4.8 gigawatts. Merrill Lynch has 5.2 gigawatts. A Q-Cells' presentation referred to a UBS number of 8 gigawatts. Even if you de-rate the 12.4-gigawatt number to account for "actual" vs. "nameplate" capacity; even if you attempt to adjust for "press-release" vs. "actually built" capacity, the numbers are still very out of balance. Even the most optimistic 2009 demand guesses fall far short of what the industry intends to produce. The PV industry is heading for 50 to 100 percent capacity oversupply, at least. To put that in context, consider that stock prices in the similarly fast-growing LCD panel industry regularly drop by half, or double, as the industry's supply and demand move out of balance (up or down) by a mere 10 percent. The situation quickly approaching in the PV business is much more dramatic. While there have been recent rumblings about oversupply, I expect the 2008 installed-capacity number of 12.4 gigawatt to come as a surprise to many. Lehman, for example, as recently as in its Nov. 1 report, had 2008 year-end production capacity at 7.8 gigawatts. While manufacturers have been aggressively ramping for the last 18 months, since October 2006, the rate of capacity-increase announcements has recently accelerated to new highs. Not only does everyone want into PV, but they all know they need to scale up to top-10 status in order to stay viable. In addition, PV has relatively low barriers to entry. Taiwan manufacturers, for example, see PV as a new opportunity requiring less investment and less risk than offered by the chip/components businesses and are now moving in. They will not abandon a fast-growing market to the mainland. See, for example, Gintech's 2008 plans for 580MW. The Chinese producers have recently been accelerating plans to maintain their scale advantage, and thin-film companies are accelerating plans in order to leverage their cost advantage. Silicon-based manufacturers are increasing thin-film investments as a risk-mitigation measure. Second-tier players understand the need to achieve scale; I've seen no less than three companies indicating they intend to be No. 3 in the industry in a couple of years. At the same time that production plans are accelerating, the worldwide subsidy picture is slowing somewhat. In Germany, feed-in tariffs for new projects decline annually, but there are plans (based on biennial review of the EEG program) to speed up the decrease, ultimately to 9.5 percent annual declines for large projects. Whether this decline will begin in 2009 or 2010 is unclear, but it will certainly pressure the economics of projects and, thus, the price points of suppliers. The Spanish situation is similar. There is a present burst to get projects turned up by September in advance of legislative changes to reduce tariffs by roughly one-third. In the United States, of course, the demand picture is completely unclear since Congress failed to address PV incentives in the recent energy bill. My guess is that, in an election year, with a poor economy and a recently demonstrated lack of political support, the industry will be lucky merely to see present incentives extended a few years.